It seems like I have heard about the Browns draft picks and strategy since October. With the draft a week away, I am going to throw my two cents in for what play maker the Browns should take with their #4 pick. 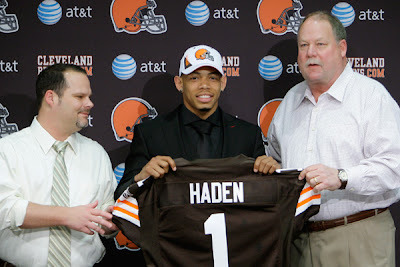 Before I get into that though, there has been troubling rumors about the Browns trading down to accumulate more picks. My response to that is an unequivocal NO. No. No. No. No. No. The Browns need to stop being draft horders and quit with the cutsey "I'm smarter than you attitude". Look where that got us...no RG III. We have 13 picks for crying out loud. Barely half of those guys will even make it through training camp. We need to be smart and take the best available players. We have so many holes right now, that the Browns need to be thoughtful about each guy. Ahem. So barring the Browns pulling some ridiculous stunt, I think that there are 4 players that would make the most sense for the Browns. I am only going to look at the Browns' #4 pick because I think after that, everything else planned really goes flying out the window. Heaven knows the Browns need a great receiver. Part of the problem with McCoy and most other Browns quarterbacks is that they have not had any weapons. No one to throw or hand off to results in a flattened quarterback. More on quarterbacks later. 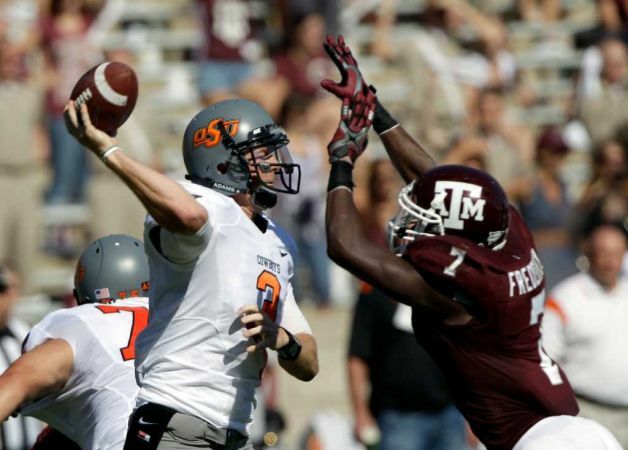 Justin Blackmon, a fourth year junior at Oklahoma State has busted all sorts of NCAA and Oklahoma State records. He broke Larry Fitzgerald's record for sophomores. He has been compared to Dez Bryant, both on and off the field. I have concerns about Blackmon's character and off the field antics. He has already been popped for a DUI and more troubling, after the Fiesta Bowl, he passed on taking the team chartered plane home and instead went directly to Vegas. When it came time for the Combine, he put in an average workout and opted not to participate in some of the challenges, raising red flags for the NFL scouts that he wasn't prepared. 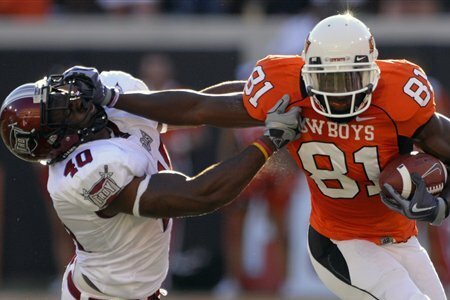 To me, Blackmon is going to end up a knucklehead just like Braylon Edwards, and look where that got us kids. Oh yeah, and there was that little thing about him not wanting to play in Cleveland. I vote pass on Blackmon. Speaking of passing, the Browns have once again created a quarterback controversy in going after RG III. The Browns have put it out there that McCoy is not their guy. I sadly, agree. I hope I am wrong, but I don't think McCoy and his noodle arm have what it takes to be a franchise quarterback. With that being said though, he really hasn't had the chance. I don't want to take a quarterback with our first pick, but there are two names being bounced about. 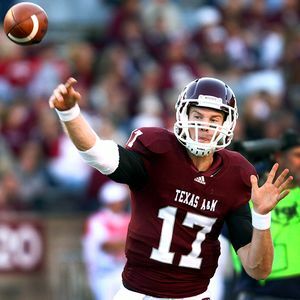 Texas A&M Quarterback Ryan Tannehill. Ryan Tannehill seems to be high on many Browns fans lists, but I say stay away. Far, far away. He is athletic but a green quarterback. We are talking Kermit kind of green. The kid has only had 19 starts as a college qb, and I'm not willing to waste our pick on him. I'm not saying the Tannehill can't make it in the league, but we need guys that can contribute *now* not in a year or two. I think he has the ability to be a franchise type of guy, but not yet. He still has a lot left to develop in his skills, and tick tock we can't wait. Oklahoma State Quarterback Brandon Weeden. If I had to take a quarterback, I would pick OSU's Brandon Weeden over Tanehill. I like the fact that he is a little bit of an older guy, he was a professional baseball player before college, so he has the knucklehead junk out of his brain already. I'm ok if the Browns want to take Weeden as a second round pick, but not at #4. Once again, the Browns need a franchise guy, and I'm not entirely sold on him yet. Now we finally make it to my pick. My head will explode if the Browns don't take Trent Richardson from Alabama with their #4 pick. Yes, he is a running back. Yes, the Browns are running the West Coast Offense. So were the Seahawks when they grabbed Shaun Alexander. With the release of Peyton Hillis, the Browns have given themselves yet another giant hole to fill. Richardson can plug the hole nicely. His workout ethic has been impressive and he has the ability to break tackles and bust through the line. Not only does he have the skill for the position, he has the character. I'm tired of chuckleheads that waste everyone's time. He has already shown himself to be a guy of character (taking the girl to prom was a bonus) and he could be a contributor to the community. Look and Joe Haden and Josh Cribbs - those guys have embraced the city, and there is something to be said for that. What I can say is that I'm tired of waiting for next year. This draft is for next years to come. Let's get it right.